Figure 11.5 The class C3 tumor involves the horizontal segment of the carotid. 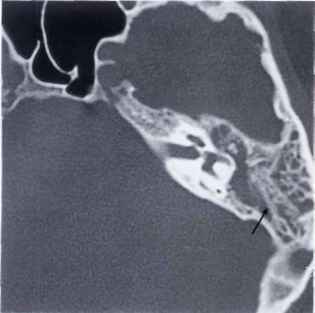 Figure 11.6 The class C4 tumor grows to the anterior foramen lacerum and extends to the cavernous sinus. Class D indicates intracranial extension of the tumor. This might be extradural (De) or intradural (Di). Figure 11.7 Left ear. Glomus tympanicum or class A tumor. The small red mass behind the anteroinferior quadrant is localized on the promontory and does not extend towards the hypotympanum (see Fig. l1.7). Figure 11.8 CT scan of the case presented in Figure 11.7. The lesion is limited to the region of the promontory. There are no visible signs of bone erosion. Figure 11.9 Left ear. Class A glomus tumor. The tumor is again limited to the promontory (see Figs. 11.10 and 11.11). 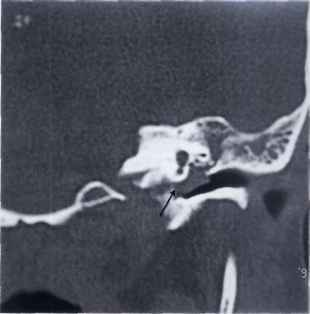 Figure 11.10 CT scan of the case described in Figure 11.9. 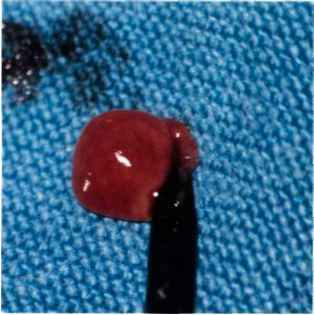 Figure 11.11 The tumor was removed using a transcanal approach after having bipolarly coagulated the tympanic arteries that supply the tumor. Figure 11.12 Left ear. Another example of a small class A glomus tumor. Figure 11.13 Left ear. 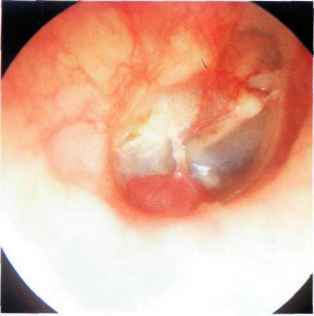 This small glomus tympanicum tumor is situated in the anteroinferior quadrant of the middle ear near the tubal orifice. Further growth of the tumor can block the tubal orifice, leading to middle ear effusion. Figure 11.14 Left ear. Class B glomus tumor or hypotym-panic tumor. The reddish mass is visible through the inferior quadrants of the tympanic membrane. Figure 11.15 CT of the case presented in Figure 11.14. Tumor extension towards the hypotympanum is observed. There is no erosion of the bony plate covering the jugular bulb. Figure 11.16 Right ear. Class B glomus tumor. 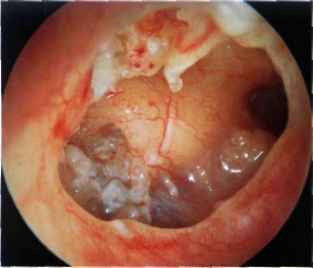 The highly vascular red tumor mass pushes the tympanic membrane laterally. A middle ear effusion is present. Figure 11.17 Right ear. Class B glomus tumor. An air-fluid Figure 11.18 Left ear. Type B glomus tumor. The tumor level due to middle ear effusion is seen together with the causes bulging of the posterior quadrants of the tympanic tumor. A tympanoplasty removed all of the tumor while con- membrane (see CT scan, Fig. 11.19). 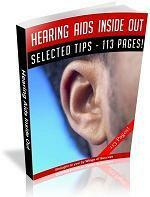 serving the excellent preoperative hearing. Figure 11.19 CT scan of the case in Figure 11.18. 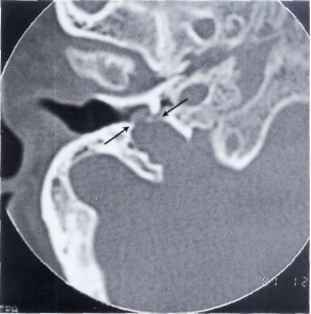 An axial section demonstrates the presence of effusion in the mastoid due to retention. Figure 11.20 CT scan of the case in Figure 11.18. The tumor extends to the hypotympanum but does not erode the bone overlying the dome of the jugular bulb. Figure 11.21 Right ear. 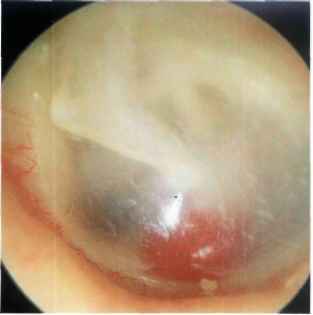 Reddish mass protruding from the inferior wall of the external auditory canal. Figure 11.22 CT scan of the previous case. 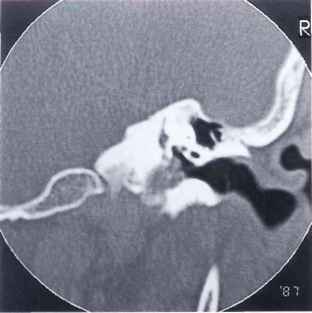 Axial view demonstrating the erosion caused by the tumor of the bone overlying the jugular bulb. This tumor can be considered an intermediate class between B and C. The tumor is localized in the hypotympanum and extends to the jugular bulb but does not invade it. 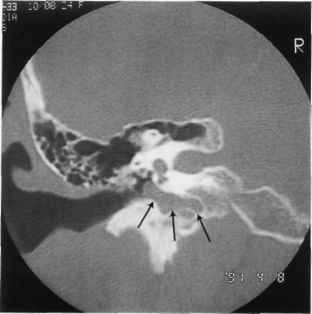 Figure 11.23 Coronal section giving a better view of the tumor extension towards the jugular bulb. Intraoperatively, no invasion of the bulb was noted and the integrity of the bulb was thus conserved. How to tell if a baby has an ear infection?